You got any holiday parties on the calendar this weekend? I’m attending both a kindergarten and a first grade holiday party today. Anyway, I wanted to share a delicious appetizer idea in case you are hosting a party or going to a party or just want something yummy to snack on while you watch Elf for the 15th time this month. And I also wanted to mention my favorite sparkling wine because everyone loves the person that shows up with an amazing bottle of bubbly wine! I have talked about my intense love of Gloria Ferrer Caves & Vineyards in another blog post (meyer lemon cake recipe! 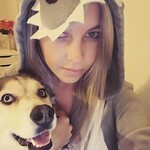 click it!). 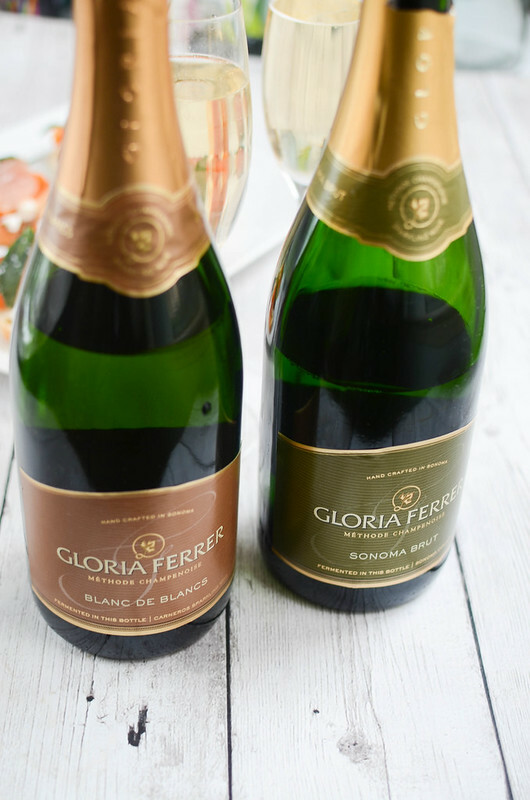 The Gloria Ferrer sparkling wines are my go to for sparkling wines. They were the first sparkling wine house in Sonoma Carneros and were also the first to bring back clones from France to plant. Gloria Ferrer Caves & Vineyards has been open since 1986 and now have 335 acres under vine. In the last 5 years, they’ve earned over 500 gold medals and 50 90+ scores. They’re also one of the few wineries that still use a hands on harvesting method. Their people start at 2 in the morning and work until 10 am! 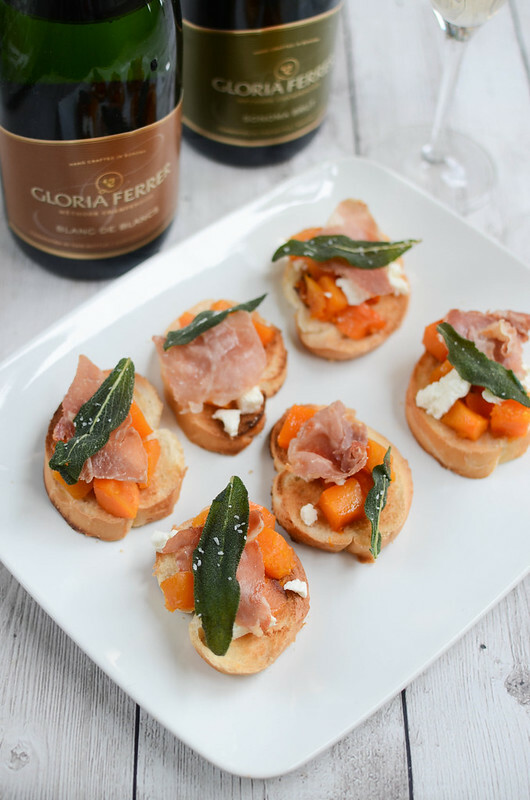 So for this recipe, I wanted something to pair with the Gloria Ferrer Blanc de Blancs. It’s made exclusively with hand-harvested Chardonnay and is known for it’s rich textural qualities and complex aromas and flavors. 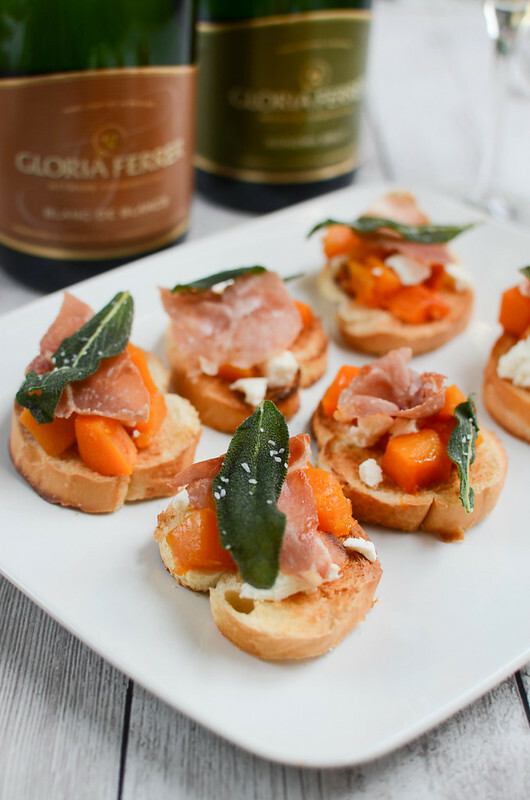 It is absolutely amazing and pairs wonderfully with a soft cheese like a goat cheese. But since we’re in peak squash season, I wanted to make something with butternut squash. 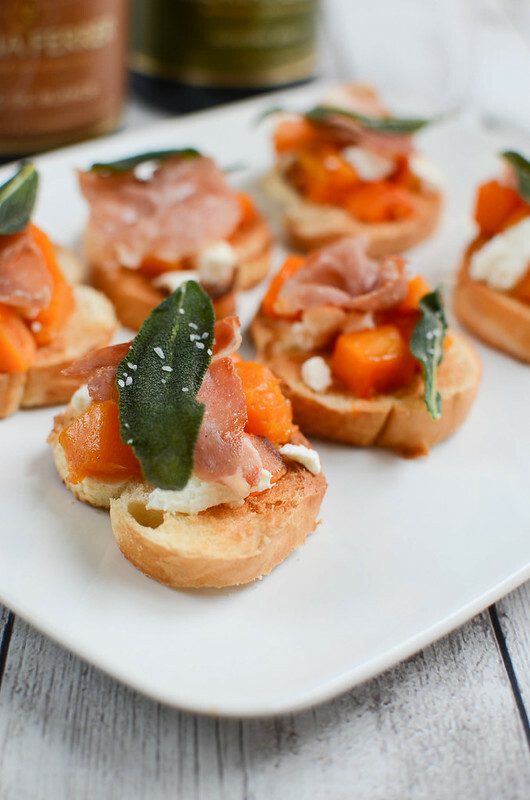 So I took some toasted baguette slices and topped them with honey roasted butternut squash, goat cheese, prosciutto, and crispy fried sage. You guys, it’s so good. And it’d be perfect for any holiday party you’re hosting! In a mixing bowl, toss together butternut squash, 1 tablespoon olive oil, honey, and 1/2 teaspoon salt, making sure all the squash is coated. Transfer to baking sheet. Bake in preheated oven until softened, about 20 minutes, depending on the size of your cubes. Let cool slightly. Meanwhile, toast the baguette slices until golden brown and place on a platter. To make the crispy sage, heat 1/4 cup olive oil over medium-high heat. Add sage and fry on both sides until crisp, just a minute or 2. Drain on paper towels; sprinkle with coarse salt while still hot. To assemble, spoon a generous amount of squash onto each toasted baguette slices. Sprinkle goat cheese on top. 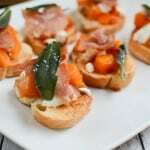 Top with a slice of prosciutto and a crispy sage leaf.